Strength comes in many forms in the varied patchwork of the AfterFall. Rosie Perth, the final member of the Harbingers, is vibrant proof of that fact. 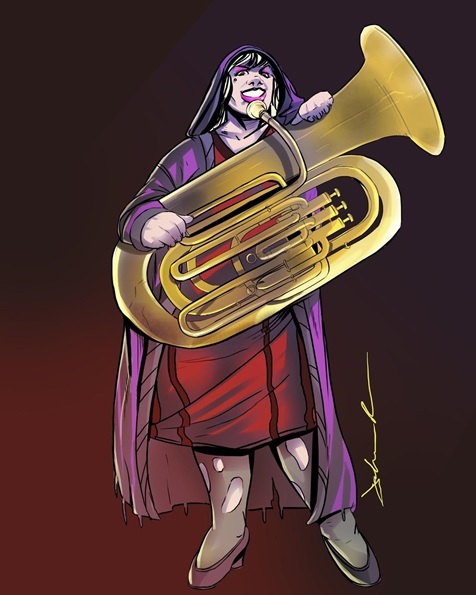 Before rounding out the band with the powerful sound of her tuba and her warm but commanding presence, Rosie was a strong and respected relic hunter for the Patriots. Her resolve and tenacity made her stand out among the ranks, and when she found her instrument–an Old World relic no one had ever seen–she stood out even more. She likes it that way. Her solid rhythms and pounding music add a depth and vibrance to the band’s sound that always draws notice. But most of all, Rosie provides a strong foundation and a unifying force for the band’s sometimes chaotic styles and often clashing personalities. She helps shape the group into a family, and provide the world with life, not just survival.